Was there a major explosion at Iran’s Fordow nuclear facility? Iran says no. Israeli intel officials say yes. Mystery deepens. 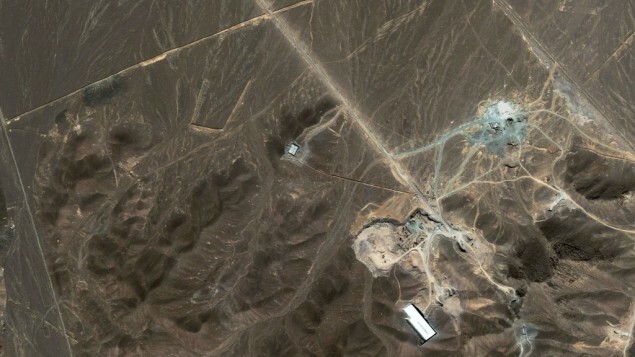 Satellite photo of the Fordow uranium enrichment facility near Qom, Iran. What really happened there last week? Not a single major media outlet in Iran, Israel, the U.S. or elsewhere reported on the story at the time, much less confirmed it. Iranian officials flat out denied there had been any explosions. This led to concern that Kahlili’s report was unreliable and that this was all mere rumor. Over the weekend, Avi Dichter, Minister of Israel’s Home Front Defense Command and former head of the Shin Bet (Israel’s FBI), welcomed the news. “Any explosion in Iran that doesn’t hurt people but hurts its assets is welcome,” he said. The German newspaper Die Welt also reports a major explosion did happen, at some 190 workers were injured or killed. If such an explosion really happened, was it an accident, or sabotage? If it was a covert operation, was it was run by Israel, or by the U.S.? For now, it’s a mystery, and a fascinating one at that. As I wrote about in my e-book last fall, covert ops have played a major role in damaging Iran’s nuclear program in recent years. The success of these operations have, at time, reduced the need for a full-blown war to neutralize the Iranian program. What does 2013 hold? It’s too soon to say, but the plot is already beginning to thicken. Just a little hint….the nuclear facility at Fordow is featured prominently in my upcoming novel, Damascus Countdown (releasing March 5). Come with me and The Joshua Fund to Israel in 2013 for a “Prayer & Vision Tour” and Epicenter Conference — you’ve read about Israel, now come step into the story. Learn more about The Joshua Fund, and consider financially supporting this important work to bless Israel and her neighbors. « A few thoughts on International Holocaust Remembrance Day. Also, here’s a link to my video report from Auschwitz.